After riding back south from Rio Blanco in Nicaragua we spent one night at the tourist town of Granada, the port town at the north of Nicaragua. It's all full of tourists from all over the world, an easy gringo destination with a nice climate and beach and lake and great gringo services. Made us a little crazy though. In the morning we got on the 3-times-per-week ferry out to the island of Ometepe, in the middle of the lake. It took four hours and we got in after dark, but the next morning we found a beautiful island with a pair of dramatic volcanoes. We spent 3 days exploring and waiting for the ferry that would take us all the way to the bottom of the lake where we crossed into Costa Rica. 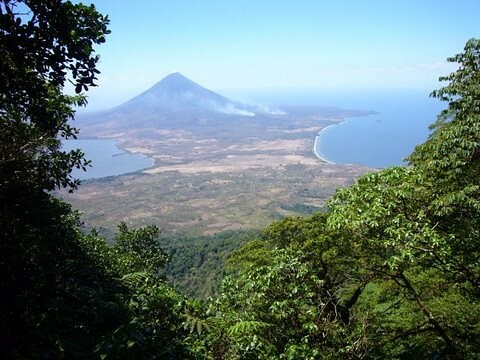 If you ever want an easy place to get away from it all and spend a week or so with a really easy lifestyle, Ometepe is the place. So laid back and beautiful. Cheap. Good tourist services. Lots of hikes and things, and you're in the middle of a huge lake so there's lots of beaches and beachfront hotels. A very nice place.